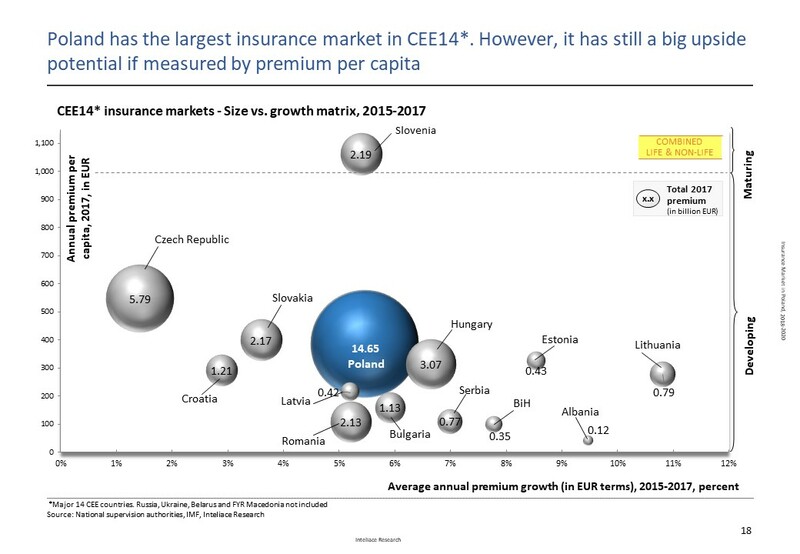 Poland has the largest insurance sector within the CEE with nearly € 15 billion in premium written p.a. and over 41% regional share in terms of GWP. 2017 was a good year for insurers operating in Poland. Premium written in non-life insurance surged by 18% YoY to nearly PLN 37.8 billion fuelled primarily by car insurance and benefiting from both higher tariffs and increasing number of insured cars. Also financial risks, health-related and property insurance sustained fast growth. By contrast, a remarkable reversal took place in the life insurance segment. After multiple years of declines, life insurance premium rebounded and started to grow again. This was possible thanks to much higher sales of unit-linked insurance – a result of multiple factors, including stronger equity markets and low interest rates at banks. Overall life insurance premium advanced by 3 %YoY and reached PLN 24.6 billion in 2017. Slide 36: Network multi-agents: Unilink, Consultia, CUK, Conditor, LGK etc.